Toyohara Kunichika (1835-1900) Six Selected Famous Actors (Haiyu Rokkasen): Carp and Waterfall Kimono, 1873. Oban. The vast quantity of Kunichika’s output was commissioned as long series of related prints. Some of these, such as the One Hundred Portraits of Ichikawa Danjuro, ran, as the name suggests, to one hundred prints alone! Series like these were designed to a template that was common to all of the related sheets. Hence, the cartouche, divisions of the sheet, pose of the actors etc would be similar throughout. This short series is one of Kunichika’s finest from the 1870’s. Each actor is dressed in a kimono of different design and takes the part of an onnagata in role - portraits of male actors in female roles. Notable here is Kunichika’s use of the very new western-style umbrella for this series. Kunichika’s relationship to the post-revolution government was at times equivocal. He was sometimes openly hostile or satirical of the rapid westernisation of Japan and at others was more accepting of its unusual and inevitable innovations. Certainly in this series the motif of the umbrella, which appears in all six of the prints, is presented as a fashionable, positive item, contrasting strangely to our eyes with the traditional costume and onnagata actor reminiscent of Edo culture. This is a beautiful print from a fine series and typical of the style and design of mid-career Kunichika. 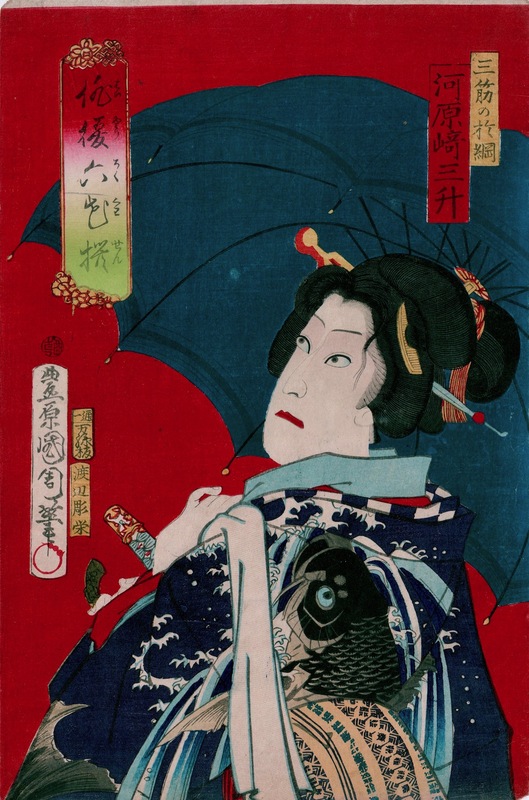 The print is rich with bokashi shading and lavish in its use of Meiji reds and blues. The piece is trimmed to the image and mounted on album backing paper. Colour and impression are fine and condition is excellent. Embossing to areas of the kimono. A fine print from the first edition.